BetStars have revealed that Sean Dyche is the most attacking minded manager in the Premier League. Using StrataBet data, BetStars have ranked each manager in the Premier League based on the percentage of substitutions made during games which are considered attacking. BetStars wanted to look at how ambitious managers are with their substitutions, so they constructed an algorithm to grade every in-game change by how attacking – or defensive – it was, based on the position and attacking contribution of the two players involved plus the scoreline and timing. For example, Pep Guardiola replacing central defender Vincent Kompany with striker Gabriel Jesus against Newcastle in the first half and with the game still goalless ranks as the most attacking swap this season, while his removal of Jesus for another centre back – Eliaquim Mangala – when 2-1 up against rivals Manchester United is the most defensive. Ranking each of the Premier League’s ever-present managers this season by the percentage of substitutions they have made which were attacking reveals a few surprises. 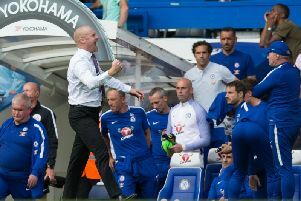 Leading the way, with almost two thirds of his changes being attack-minded, is Burnley’s Sean Dyche, followed by Arsenal’s Arsene Wenger, who has made a higher proportion of attacking changes than any of his top six rivals, with Antonio Conte and Marco Silva tied for third place. All but one of the Gunners’ challengers for a Champions League place can be found in the attacking half of our rankings, with the exception being Liverpool’s Jurgen Klopp. He ranks as the division’s third most defensive coach when it comes to making changes, with the two managers below him both in charge of newly-promoted teams. Brighton’s Chris Hughton and Newcastle’s Rafael Benitez have both made defensive choices for almost two thirds of their substitutions this season.